I plan to retire...right after lunch on the day I die! Until then I'm here to serve God, love people and talk about Jesus! We all wear masks. Masks that tell others we are "ok" when we really aren't. In public most of us pretend we have it together, all is well, but if we could see what others struggle with it would change how we interact with each other. 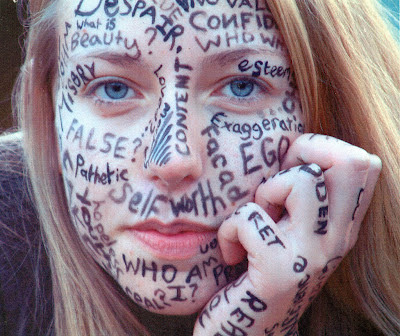 If we could see that a friend is insecure how would we treat them? If we could see that a neighbor is afraid what would we do? If we could see that a co-worker is depressed what would you say? If we could see what's really going on with each other it would change everything......but we can't. We all wear masks to make the world think we are "ok", but imagine how our relationships would change if we could see what's really going on in a life? It would change everything! "Be merciful, just as your Father is merciful. “Do not judge, and you will not be judged. Do not condemn, and you will not be condemned. Forgive, and you will be forgiven. Give, and it will be given to you. A good measure, pressed down, shaken together and running over, will be poured into your lap. For with the measure you use, it will be measured to you.”"
Thanks, Mike. So true. I love the picture - it says it all. We all are a mess in our own way. It's sad that we tend to be so self-centered that we don't even THINK that someone else could have a problem worse than ours. I don't think we mean to, I think it's just like your last blog said...it's our perspective. We get so bogged down in our own mire that it's hard to crawl out and even think about someone else's mire. Thanks for this post. Good stuff. Mike...this is really a good post. We only live once and then comes eternity. I want to live in, walk in, soak in the love of God to such an extent that others are drawn to God because of their encounter with me! Finishing Well is all about how we live our moments. The moments and encounters with others add up to a life lived for self or for God. At the end of my life may people say, "He lived for Christ. He finished well." The most important decision anyone will make is what they believe about God and his message to mankind. If you don't know God personally, but would like to know his love and forgiveness I invite you to take a moment to find out about the GOOD NEWS! There is a web site with stories of lives changed by knowing Jesus Christ as savior. It's a place I invite you to visit. It's called "I am second." 3. I reserve the right to delete any comment without any reason at all. You are welcome to copy any of my posts and use them to encourage others. The only thing I ask is that you use these posts as they were written, include an author credit and link to this site. Other than that copy away! Is He able? Is He willing? Don't wait to say "Thank you"
Could heaven have it right? "The Finishing Well Hall of Fame" is made up of those who have lived their lives to the glory of God and Finished Well! The members of the Hall of Fame are selected by lives lived well and their impact on others. Nominations are welcome. Please include the persons story with any nomination.